Additional appointment information and pricing is available by contacting our Coordinator at our Elm Grove location, 262-785-2890. 1. How do I begin booking my salon appointments for my wedding day? After choosing the Studio 890 Salons and The Art of Hair for your wedding day, you will need to contact our Wedding Coordinator. Our Wedding Coordinator for all 3 salons is located at our Elm Grove location at 262-785-2890. She will be able to assist you with all of your needs. 2. Will I be able to book my appointments for my wedding when I speak with the Wedding Coordinator? a) After sharing some brief information with you, and checking the availability for appointments on your wedding day, our Wedding Coordinator will send you an informational packet. b) After receiving the informational packet, you will need to return the enclosed forms with all requested information. Immediately after contacting our wedding coordinator, you should start determining who in your wedding party will require services on your wedding day. Keep in mind Mothers of the Bride, Mothers of the Groom, Flower Girls, etc. besides your other attendants, would be best to have their hair professionally styled and booked at the time you are booking your appointments. c) You will also want to book appointments for make-up to guarantee a flawless application that will hold up throughout the day and night. d) As soon as our Wedding Coordinator receives the returned forms, she will send out your information and give you the amount for the non-refundable, non-transferable deposit. The deposit amount is based on 50% of what the total in services would be. Please be sure to plan your appointments very carefully, your deposit is NON-REFUNDABLE. If anyone in your wedding party should decide to cancel any or all of their appointment deposit for these reservations will not be refunded and cannot be transferred to other services. e) Upon receiving your deposit and completed wedding forms we will reserve your appointments and provide you with a detailed report of your appointments. f) The remaining balance will be due no later than 30 days prior to your wedding date. 3. What if I want to extend the number of people to receive a service? You may extend the number of people to receive services but may be limited by our Salon Professionals availability. Based on the time of the addition, an additional deposit may be required or total amount added to the final payment. 1. What is a practice session and why do I need one before my wedding? A practice session is an opportunity to try out the hairstyle in advance, before your wedding day. If the hairstyle that you envisioned does not look as good on you as you had hoped, you'll be able to choose another. It can also help you with timing on your wedding day. 2. How should I prepare for my practice session? Before going to the stylist, try to develop a good idea of what type of hairstyle you would like. Cut out the pictures of your favorite hairstyles from magazines and bring them to the stylist. If you can't find any pictures, be prepared to describe exactly what you want. For the practice session bring a Polaroid or digital camera to take pictures. Ask the stylist to take pictures from the back and other angles. The pictures will give you a better idea how the style would look to others (as opposed to just looking in the mirror). 3. How much time should I allow for a practice session? The time allowed for your appointments will be based on what services you will be receiving. Based on your services and time of wedding your Wedding Coordinator will be able to book your appointments to depart the salon at your requested time. Most appointments average one and ½ hours. 4. Should all members of my party have a practice session? It is not necessary that all members of your party have a practice session, if you should choose to have them involved in the practice session our Wedding Coordinator will be able to assist you. 5. What if I do not like the style from my practice session? A practice session is the perfect opportunity to try out your style. If you do not like it, are uncomfortable with it, or it just isn’t what you pictured we work with you to find and try a style that is perfect for your big day. 6. What should I do after my practice session? Walk around with this hairstyle for several hours to make sure it's comfortable. The last thing you would want is to have hair pins hurting you and ruining your fun. Make sure your hair style does not get completely messed up several hours later. Try moving around and see if the hair stays put. 1. When should I see my Salon Professional to discuss a hairstyle? You should see your Salon Professional as soon as you have your dress picked out. 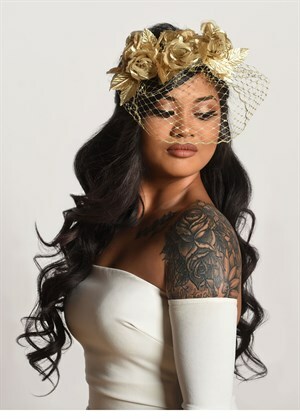 You may choose to see the Salon Professional before you get your veil/headpiece to determine what type would work with the style you have in mind or you may talk to your Salon Professional after getting the veil/headpiece to see what styles would work with the piece. 2. What should I consider when choosing my hairstyle? The following should be considered: your dress, your veil/headpiece, your hair type, hair length, face shape, time of day of the wedding and your desired look. Choose a style that you feel comfortable moving around with and able to enjoy your day in. Your Salon Professional will be able to help you with this. 1. What other services should I consider? There are many services available at the Studio 890 Salons to consider before your wedding day. Some services you may consider to enhance your beauty include waxing, full nail services including pedicures, facials and massages. We offer facial, brow, leg and bikini waxing. If you are just starting with the waxing process you may want to begin with treatments up to 2 months in advance. For previous waxing clients we recommend having your service a few days prior to your wedding date. 3. How close to my wedding day, should I have a manicure ? For beautiful hands and nails you may want to begin 3 months prior to your wedding with a manicure w/paraffin treatment every other week. The month of your wedding manicure w/paraffin treatment once a week. Finally- a manicure w/paraffin treatment the day before your wedding. Follow the recommended home maintenance regimen. 4. When should I have a pedicure? For beautiful feet begin 6 months prior to your wedding with a pedicure once a month. With your manicure have a pedicure the day before your wedding. Follow the recommended home maintenance regimen. 1. Is it good to have a facial before my wedding? Facials are an excellent way to achieve and maintain beautiful skin. 2. What should I do to have flawless skin for my wedding? Some tips to consider are to stay out of the sun but if you do expose the skin to sun always use a sunscreen. Keep the skin hydrated, cleanse and moisturize daily and exfoliate 3 times per week. Consult our Esthetician for a customized home regimen. 3. How soon should I start concentrating on my skin for the wedding? No matter what your age, a skin care regimen should be a part of your daily routine. You can never start too early. 4. What about make up touch ups during my wedding day? You may want to designate your Maid of Honor to assist you with make up touch ups. She would be responsible for carrying the products you need to refresh your make up throughout the day and night. During your practice session talk with your Esthetician regarding what products you will need.